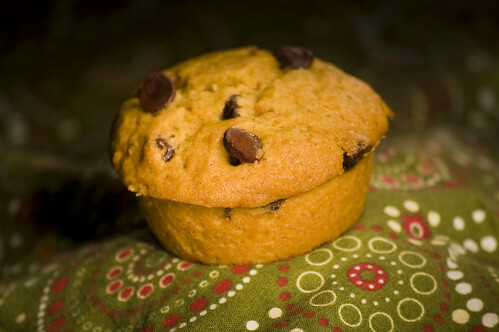 Grease muffin cups or line with muffin papers. Thoroughly mix flour, sugar, cinnamon, baking soda, baking powder, and salt in a large bowl. Add pumpkin and butter to eggs and whisk until well-blended. Pour over dry ingredients and fold in just until moistened. Scoop into tins and bake 20-25 minutes. I use silicone muffin pans and canola spray, and I tend to add the dry ingredients to the moist stuff, which is backwards, but still seems to work fine. I also tend to freeze most of them, which works well when you’re running out the door and need something for lunch (or a mid-morning snack) as they defrost over the course of a few hours and are ready to eat. Posted on Monday, November 22nd, 2010 at 8:16 am. Subscribe to the comments feed. Both comments and pings are currently closed. Post on your own blog. These sound (and look!) fantastic.